So, as I said in my birthday round-up post, I didn't have a party as such, but rather a series of small get-togethers to celebrate my thirtieth. The closest thing I had to a party was a little pyjama party - popcorn, snacks, gossip, PJs and junk food! I made a baby chocolate cake to celebrate - a half quantity of Nigella's chocolate cloud cake (Nigella Bites), which I baked in an 18 centimetre tin. I've wanted to make Nigella's Chocolate Cloud Cake for ages, ever since I got Nigella Bites about ten years ago.... but seem to have got distracted with Nigella's other chocolate cakes, in particular her heart-stopping Chocolate Fudge Cake (also from Nigella Bites). 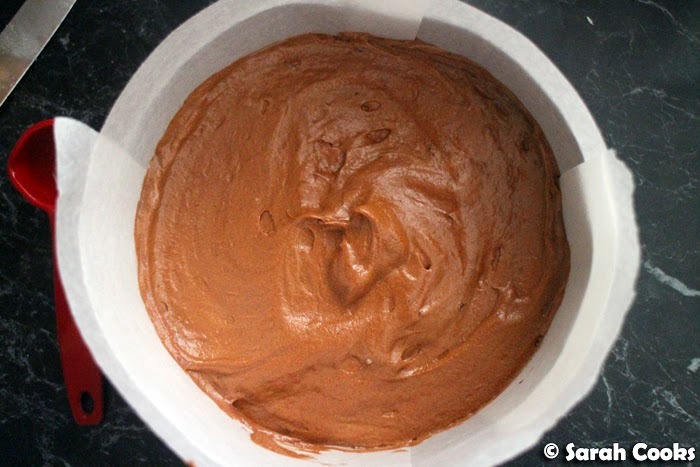 I thought it might be fun (for me, at least) to compile a little list of the different Nigella chocolate cakes that I have made and blogged (or mentioned in my blog), and it seems that I have made a lot of Nigella's chocolate cakes. Ahem. Here's the list! I haven't published the recipes for any of these cakes - but lots of the recipes are already available online at Nigella's website, and of course in her wonderful books! 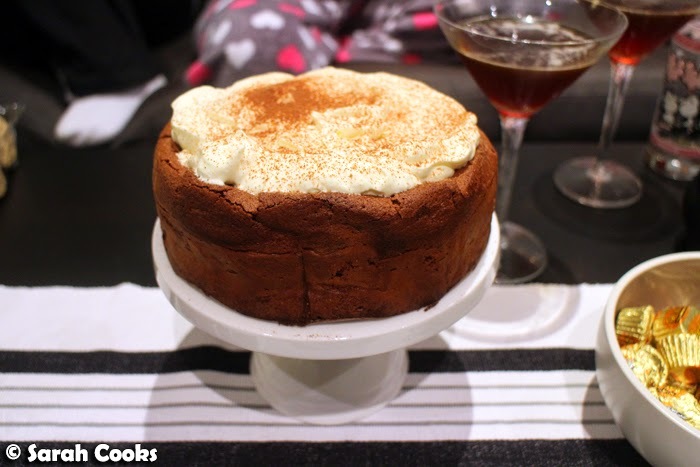 I've put the recipe for my miniaturised cloud cake below, and linked to the original recipe (available on Nigella's website), in case you want to make a glorious full-sized 23 centimetre cake for yourself! (Oh! And I also omitted Nigella's suggested orange zest and cointreau, replacing them both with the much-more-delicious Frangelico). 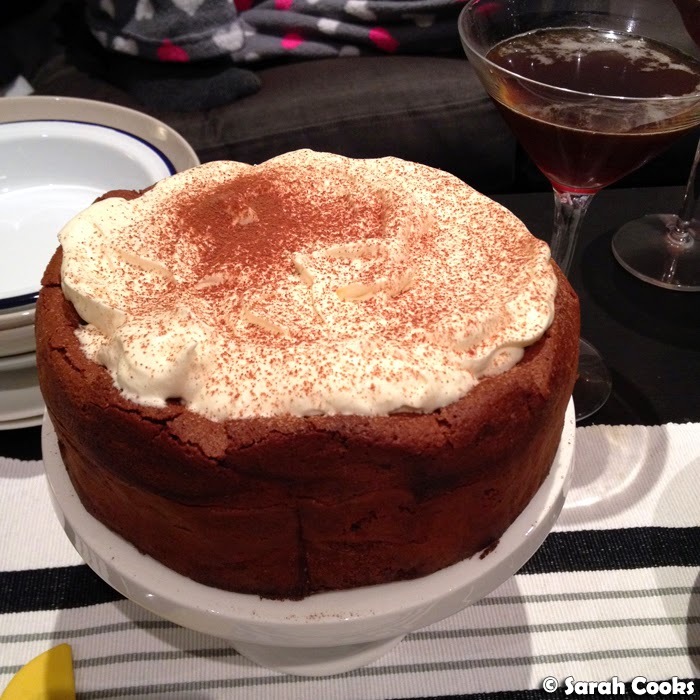 So the Chocolate Cloud Cake is a sunken chocolate cake - just chocolate, butter, eggs, and sugar, with the egg whites being whipped to provide lift. There's no flour or almond meal to provide heft or stability - this is a fabulously dense cake. Without any flour in the batter, the cake does sink quite a bit on cooling, providing a lovely crater to fill with whipped cream. The cake was exactly how I hoped it would be - chocolatey but not overly dark, both light and dense at the same time. I found it almost similar to a trifle, with all the cream melding deliciously into the cake layer. (I thought it looked nicest freshly decorated, but found that the remaining slices tasted even better after a night in the fridge.) Why on earth did I wait ten years to bake this cake? Preheat the oven to 180C. 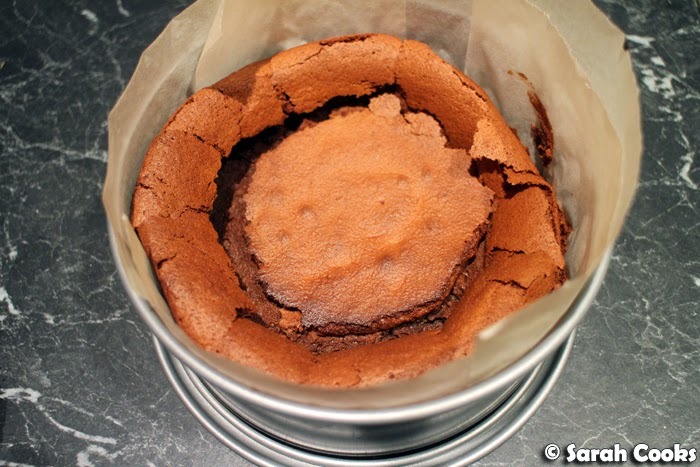 Line the base and sides of an 18-cm springform tin with baking paper. Melt the chocolate in one-minute bursts at medium power in the microwave, stirring between each time until almost melted. Add the butter and let it melt in the warm chocolate. Whisk the whole egg and 2 yolks with 40 grams of the caster sugar until combined, then add the melted chocolate and butter mixture, and the Frangelico, if using. In a separate bowl, whisk the 2 egg whites until foamy, then gradually add the remaining caster sugar (50 grams), whisking until smooth, glossy and holding its shape. 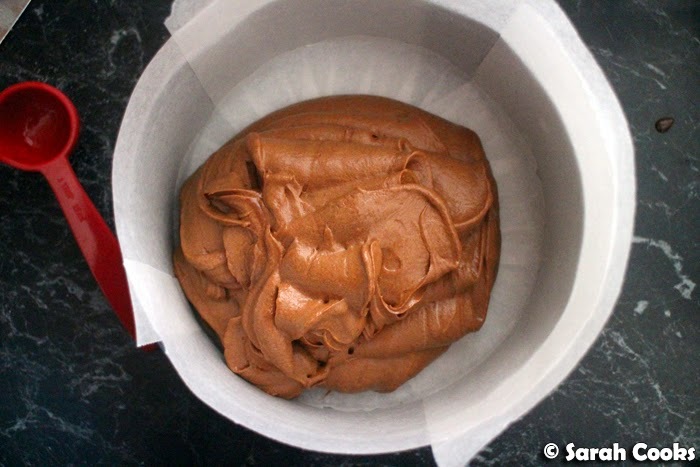 Add a large scoop of the whipped egg whites to the chocolate mixture, and fold in gently with a whisk. Add the remaining egg whites and fold gently to combine. Pour and scrape the mixture into the prepared tin and smooth the top with a spatula. Bake for 25 minutes, or until the cake is risen and cracked. It should still be moist in the middle, so a cake tester will not come out clean. Just jiggle the pan - it should wobble a little but not be obviously liquid underneath. Place the cake tin on a wire rack to cool completely. When you are ready to serve, release the cake from its springform tin and place on a serving plate. Whip the cream, vanilla and Frangelico together until soft peaks form. 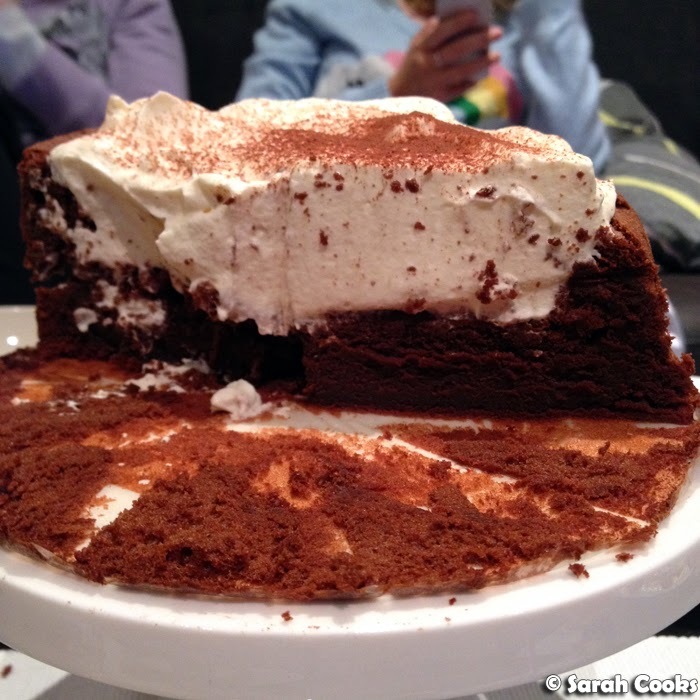 Fill the crater of the cake with whipped cream and dust the top with cocoa powder. I love you for removing the devilfruit from this cake. Also, your round-up makes it clear to me why I don't bake Nigella cakes often - I always skip past chocolate cakes! So talented! It does really look like a cloud cake! Great job hunz! Haha, it looks like you've got a real Nigella & Chocolate obsession!